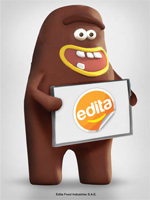 The information provided on this site is not intended for distribution to, or use by, any person or entity in any jurisdiction or country where such distribution or use would be contrary to law or regulation or which would subject Edita or its affiliates to any registration requirement within such jurisdiction or country. Neither the information, nor any opinion contained in this site, constitutes a solicitation or offer by Edita or its affiliates to buy or sell any securities, futures, options or other financial instruments or provide any investment advice or service. The information on this site is provided “AS IS.” Edita does not warrant the accuracy of the materials provided herein, either expressly or impliedly, for any particular purpose, and expressly disclaims any warranties of merchantability or fitness for a particular purpose. Edita will not be responsible for any loss or damage that could result from interception by third parties of any information made available to you via this site. Although the information provided to you on this site is obtained or compiled from sources we believe to be reliable, Edita cannot and does not guarantee the accuracy, validity, timeliness or completeness of any information or data made available to you for any particular purpose. Neither Edita, nor any of its affiliates, directors, officers or employees, agents nor any third party vendor, will be liable or have any responsibility of any kind for any loss or damage that you incur in the event of any failure or interruption of this site, or resulting from the act or omission of any other party involved in making this site or the data contained therein available to you, or from any other cause relating to your access to, inability to access, or use of the site or these materials, whether or not the circumstances giving rise to such cause may have been within the control of Edita or of any vendor providing software or services support. In no event will Edita, its affiliates, or any such parties be liable to you for any direct, special, indirect, consequential, incidental damages or any other damages of any kind even if Edita or any other party have been advised of the possibility thereof. Should you leave this site via a link contained herein, and view content that is not provided by Edita, you do so at your own risk. The content to which you link will not have been developed, checked for accuracy, or otherwise reviewed by Edita. Edita is not responsible for damages or losses caused by any delays, defects or omissions that may exist in the services, information or other content provided in such site, whether actual, alleged, consequential or punitive. Edita makes no guarantees or representations as to, and shall have no liability for, any electronic content delivered by any third party, including, without limitation, the accuracy, subject matter, quality or timeliness of any electronic content. As a result of high internet traffic, transmission problems, systems capacity limitations, and other problems, you may, at times, experience difficulty accessing our website or communicating with Edita through the internet or other electronic and wireless services. Edita strives to keep the data and information on this website up-to-date, but in some cases it is possible that data or information may be outdated.